In my home state of Oregon, a group of armed, radical militants have seized federal property. The dangers of the so-called militia movement should not be underestimated. They’re heavily armed, utterly unconcerned with the rule of law, and looking for any excuse to pick a fight. Unhappy with the U.S. Constitution’s clause establishing federal supremacy over state law, they’ve chosen to take over a wildlife refuge on public land. Their cause is, ostensibly, defense of two Oregon ranchers sentenced to prison for arson – two Oregon ranchers who, by the way, don’t want them there. Days into the standoff, government and law enforcement are keeping mum about what response will be forthcoming. To date, no real effort to end the confrontation has happened. There’s another recent historical parallel, though, involving another group with actual life-or-death concerns about federal encroachment on their property. If there is any group in America with legitimate grievances about theft of private property, it’s our continent’s native people. In 1973, a group of American Indians also occupied territory as partly symbolic, partly substantive action. Thus began 71 tense days of occupation at Wounded Knee. The tribal members were armed, like the Oregon militants. Unlike the Oregon militants, they had read and understood the Constitution of the United States, which declared that their treaties were the supreme law of the land. I imagine they had a good handle on the federal supremacy clause, too. Unlike today, the government’s response was swift: Armed marshals, FBI agents and armored vehicles surrounded Wounded Knee. In fact, the Department of Justice sent out a force of 50 marshals two days before the occupation happened, just in case. The armed sides became entrenched the day after the occupation began on Feb. 27, 1973. Historians Ian Record and Ann Pearse Hocker describe “barricades of paramilitary personnel armed with automatic weapons, snipers, helicopters, armored personnel carriers equipped with .50-caliber machine guns, and more than 130,000 rounds of ammunition.” Shooting was steady from both sides. The Wounded Knee occupying force sent out a call for people to join them. From North Carolina came Frank Clearwater, a Cherokee with a pregnant wife. The day after Clearwater arrived, he was shot in the head with a federal bullet and died. My two main points are simply these: first, the Oregon militants are not patriots. This is a group of irrational fanatics whose wilfully inaccurate readings of the Constitution and religious texts are excuses to commit violence. We must not ignore, or worse, whitewash their potential for violence. Second, we cannot ignore the role that race plays in the response to the Oregon militants. Of course the FBI and U.S. Marshals learned something in the wake of Wounded Knee, Waco, and Ruby Ridge. But we must also acknowledge that we live in an era when it is legal and, in some quarters, acceptable to shoot an unarmed black child like Tamir Rice, or to choke and then deny aid to a black man for selling single cigarettes. Race has consequences (or, for privileged groups, benefits) that play out across the news every day. We’ve known about this particular strain of anti-government activity for years, even decades. But unlike the Wounded Knee event, there’s no law enforcement response in place days before the trouble starts. Days after, there’s not even a response – let alone an armed-to-the-teeth response. Consider how this looked when the occupiers looked different. Maybe there is a good reason for how the armed, anti-American, and above all white protesters have been treated. It seems more likely that there’s a bad one. More evidence is mounting everyday that the investment-killer known as TABOR would be disastrous for North Carolina. The state provides a lot of services to everyone; that’s its job. In particular, it provides services to the most vulnerable citizens that can’t get their needs met in the private market. The for-profit market stays away from certain services – like domestic and sexual violence crisis services, and services to assist the homeless and those experiencing food insecurity – because there is no real opportunity to make a profit from those services (and also the nature of for-profit business means those businesses may feel more vested in making sure there is a continued need for the product they are selling rather than for solving a social problem). This is why we have a balance between public and private enterprise. TABOR legislation plays on the widespread misunderstanding the public has about how government is funded, and what services the government actually provides to us all (see this chart for an example of the services that may be left out with TABOR in place). These services help not just individuals, but also businesses, who make use of the investments we make in our common good – education, infrastructure, a thriving middle class – to sustain their organizations. As news continues to roll in about this apparent hate crime that took a host of lives at Charleston’s Emanuel African Methodist Episcopal Church, that pain will only expand. Actions like this have grievous consequences for years, even generations to come. Lest we forget, terrorist violence of this nature has a long history of targeting black churches. When I think of this tragedy and the community’s pain, I think of Michael S. Harper’s short but devastating poem, “American History,” which references Charleston and addressed these themes years before this latest tragedy. All I have to say about the vile motives of the vicious and cowardly man who committed these murders, Harper said better in a few short lines. My heart breaks for the victims of this tragedy, and I hope we can all take a moment to recognize the pain and loss of a community — while committing ourselves to building a world where this never happens again. Opposition to abusive lending cuts across the political spectrum. In fact, it has been uniting people for thousands of years. In North Carolina, we have a proud bipartisan tradition of protecting consumers. As Rob Schofield wrote recently, a 2009 consumer protection law that is one of the strongest in the country prevents some of the worst types of debt buying practices. But there are efforts to undermine this common-sense law. In North Carolina and elsewhere, some of those debt buyers got aggressive and deceptive in their collection techniques, including filing lawsuits that could keep consumers in court forever. In response to such abuses, the North Carolina General Assembly in 2009 passed a consumer protection law that held the debt collectors to reasonable standards of behavior. For example, as of now those collectors have to present detailed information about the delinquent debt they’re trying to collect, including when and where it originated and the amount of fees and interest that were agreed upon by the consumer. The disclosure requirement and other consumer protections came in response to a surge in lawsuits from debt collectors targeting people who didn’t owe a debt or had resolved it. Now a peculiar bill proposed by Sen. Mike Lee, R-New Hanover would do away with some of standards for collectors, making it easier for them to push ahead with suits. The collectors wouldn’t need to have that detailed information, for example. The N&O describes this, accurately, as “sticking it to the average citizen.” We have a choice between protecting the people suffering from a tough economic situation, or changing the law in favor of the companies trying to extract capital from them. The protections now in place are good ones. They help average people. They don’t change the obligation to pay true debts, or provide free passes away from legal action. The rules simply require debt collectors to prove their demands are legitimate. That’s a fair standard and it should stay. North Carolina’s simple but effective consumer protections are hard-won and effective. Let’s let them keep working by leaving them in place. 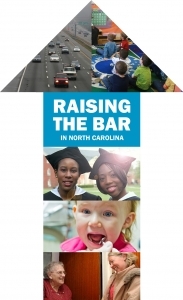 Editor’s note: The following post by Tracy Zimmerman at the North Carolina Early Childhood Foundations, is the latest installment in “Raising the Bar,” a new series of essays and blog posts authored by North Carolina leaders highlighting ways in which North Carolina public investments are falling short and where and how they can be improved. This piece is reprinted with permission from the NC Early Childhood Foundation. The full list of footnotes for this piece can be found on their website. It’s budget time for the state – a good opportunity to review North Carolina’s history of early childhood investments. Investing in strategies that focus on children from birth to age eight is the most effective and cost-efficient means to improve third grade outcomes and long-term success for children and the state. For optimal development and a strong foundation, children need good health, strong families and high quality early learning and school experiences. With quality early child development experiences, children are school ready, graduate from high school and grow into productive citizens and valuable employees. In North Carolina, the Child Care Subsidy Program, Smart Start and NC Pre-K (formerly More at Four) comprise the majority of North Carolina’s state investments in early care and learning prior to kindergarten. Together, they form the infrastructure to deliver evidence-based programs in all 100 North Carolina counties, ensure that children living in low-income working families have access to high quality child care programs and provide at-risk four-year-olds with the opportunity to start school on an even playing field with their higher income peers.